Rosanna, Raffaela and DIW generally were absolutely INCREDIBLE. The whole team went above and beyond to help make our wedding truly unforgettable. I have been a bridesmaid for 10+ friends, and have seen their planning process in the States first hand and I have to say- DIW blew everything I've seen/heard away. I have friends who have paid 10, 15, even 25K for wedding planners who have not held a candle to the quality of service DIW provides. Truly. Can not speak highly enough for DIW and the whole team there...if you're considering a wedding in Italy, DEFINITELY use this professional, organized and absolutely epic team. It was such a joy to plan your wedding Tim and Libby. What a fantastic celebration! We loved every minute! I worked with Rosanna from Distinctive Italy Wedding from the very beginning and she was wonderful throughout the entire process! She was always quick to respond and provided me with detailed packages meeting my requests from the beginning, even when I kept changing my mind. She was patient and continued to provide me with additional packages and was courteous. I highly recommend Distinctive Italy Wedding to help plan your destination wedding in Italy. Thank you Cyndi for your kind review. We are so happy that you had a wonderful experience with Distinctive Italy! My (now!) husband and I worked with Sarah and Rosanna to plan our picture perfect wedding in Greve in Chianti, Florence, Italy this August. Our expectations were far exceeded. We are so grateful to Sarah and the rest of Distinctive Italy Weddings for making the planning of a destination wedding as easy as possible. From venue sourcing, to choosing flowers, music, food, and all the other small details, they were on top of it all! I was a little nervous not being able to hand pick certain details like flowers, but we were able to send pictures of what we wanted and a mood board was created. The day of the wedding, everything was EXACTLY as we picked and wanted! From the colors, to the table design, it was perfect! We chose a Catholic Church ceremony and ran into some issues with gathering paperwork, and Sarah was on top of it directly connecting to the diocese and staying in touch with us. She made us calm and was so supportive. The day of our wedding my husband and I were able to focus on ourselves and our families, getting ready, and enjoying the entire day because Sarah was there from start to finish ensuring the vendors were setting up properly and everything was on point. If you are planning on having a wedding in Italy, WE HIGHLY RECOMMEND DISTINCTIVE ITALY WEDDINGS! We want every Distinctive Italy wedding to be magical. Sarah is thrilled that you and Patrick had a memorable stress free day with your loved ones! That is what we strive for! Firstly thanks for organising such a magical day for us! It was truly outstanding - we loved everything from the venue, to the flowers, to the food and the extra little touches like the caricaturist and Gelato cart that Stefania suggested, which really made the wedding extra special. Our celebrant Rosa was amazing, as were our photographer and hairdresser (especially doing 5 very excited flower girls!!). Villa Eliana was truly spectacular and so accommodating to our needs - all our guests have taken away memories they will treasure forever. Many people commented that the food was the best they had at any wedding and the cheeseboard and late night pizza were a hit! The music was truly special - the quarter was lovely and the band really really stole the show! And finally, a very, very special thanks to Stefania for keeping me organised and on track and being so wonderful on the day. We really couldn’t have wished for more! 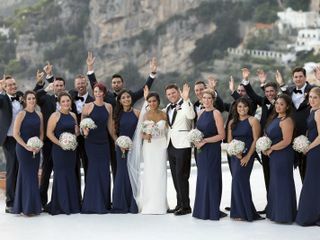 After 2 years of careful planning we could not be more thrilled to read that Martine and Steven had the wedding they hoped and dreamed for in beautiful Sorrento! Stefania was honored to be part of the planning process. Thank you for choosing us to plan your wedding! Both Tim and I were over the moon to be married to each other and to have celebrated our love in castle in Tuscany thanks to DIW. They took care of every last detail, which gave Tim and I the chance to live in the moment and enjoy our wedding without a worry! Spending the year collaborating with DIW was amazing because of their professionalism, accuracy, and resilience to produce for their clients. We were always provided with detail explanations, images, and videos when making descisions. We never felt left in the dark or that we didn’t have control of our wedding plans. Many of our guests are still talking about the "wedding of the century". People have told us they felt like they were in a fairy tale and it is all thanks to the DIW team and the vendors they recommended. My husband and I are a tough sale but we really were blown away by the entire process. Our wedding was enchanting and truly an adventure for everyone. The McCulloch's love DIW and would recommend them to any engaged couple. Your wedding dreams will come true with DIW. I was so happy that I used DIW to plan my event. Planning an international destination wedding is not the easiest, but my planner, Junko, made everything as easy as possible. She helped me stay organized and on top of things that I would have definitely forgotten or not known what to do for almost a year before my wedding. She was always available when I had questions or concerns, and would respond by e-mail very quickly. Most importantly, she was there every step of the way during my wedding weekend. She helped with everything and even carried an extra pair of shoes for me because I was worried my feet would start hurting. She was so nice and made me feel so comfortable and happy. Thank you so much DIW!! 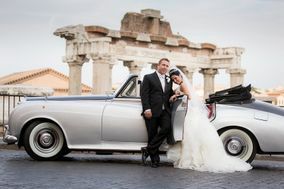 My wife and I really enjoyed working with Distinctive Italy Weddings to plan our wedding. Everything we arranged was as expected, if not better. The location for our ceremony was amazing, the venue for the reception was great, and the lodging arranged for our wedding party was impeccable. Our on-site coordinators were wonderful to work with, and we had no issues despite traveling to multiple cities and venues to accomplish all of our paperwork. Our planner even helped arrange a trip for our entire party to a local vineyard that was a great experience for all. If you are thinking of getting married in Italy, then do not fret about planning your big day. You are in good hands with Distinctive Italy Weddings! We can’t thank you enough, our wedding day was perfect, we couldn't have asked for anything more! From the beginning you made everything so easy for us and answered all our questions so promptly, I couldn’t believe it! Paola, our wedding coordinator, was fantastic! She was so kind and helpful, we were able to not stress about anything on our wedding. I didn't know what to expect from my hair and make-up since I didn’t do a trial run but both were such professionals, it was exactly what I was hoping for. The flowers... Wow! When I saw my bouquet I fell in love with it! It was so beautiful I couldn’t stop staring at it! The boutonnière was made to match my bouquet and was Perfect. We ordered a flower arch and matching rose petals for the aisle. The arch exceeded my expectations and was Gorgeous! The florists did an amazing job. Our photographer rocked! We felt so lucky to have gotten Domenico for our photographer. He made us so comfortable and captured exactly the artistic photos we were looking for. After the ceremony we had our dinner together at the Belmond Caruso Restaurant. The food was absolutely delicious and the service was impeccable. We had the restaurant make us a small wedding cake. It was Beautiful and delicious! Our amazing wedding would not have been possible without all of the lovely ladies at Distinctive Italy Weddings. Everyone we met or spoke to on our journey was so kind, friendly and helpful. They took all our thoughts, ideas and dreams for this day and made them an amazing reality. Everything on the day far exceeded any expectations we had. We literally had the best day of our lives. The fact that myself and my Husband felt little or no stress throughout the whole planning process is a sign of how amazing everyone at DIW are at doing this job. We would highly rate and recommend Distinctive Italy Weddings to any couple considering planning a wedding in Italy. They're highly professional and appear to have great working relationships with vendors who are also of the highest standard. They were always available with experienced advice, easy to talk to and above all, everyone we dealt with in DIW was so friendly and kind. Thank you both so much for helping to make our dream day a reality. I can’t even begin to put into words the absolute professionalism and class Distinctive Weddings showed over the 2 years planning our destination wedding. They made every detail we imagined come to life perfectly. I was in absolute awe and so were our guests. They Skyped, emailed, called and did everything they could to accommodate our every request. I can’t recommend them more from venue selection to on the day organization. Thank you, thank you for making our wedding week perfect in every way! Stefania and Simona of Distinctive Italy weddings could not have been more wonderful! Stefania helped me prepare every last detail leading up to the day while Simona kept everything organized on our special day. They were always easy to communicate with and I always felt like my little wedding was a priority! Our wedding was truly BEYOND anything we could have ever dreamed of. All of our guests said the wedding was “hands down, the best wedding they had ever been to!” Thank you ladies. We are forever grateful for the beautiful day you created for us! Rosanna, Sarah, and Angela were amazing. Their responsiveness and willingness to help was incredible, and I can't imagine doing the wedding without them. Everything from coordinating the plan, recommending vendors and photographers, and assistance with the consulate appointments was top notch, professional, and so helpful. Thank you to DIW and our wonderful wedding planner, Sarah Bongini, for bringing our dream Tuscan wedding to life! With her fantastic organizational skills and creativity Sarah helped us plan an intimate, 30 person wedding in Tuscany in just 8 short months. Needless to say, the outcome and services exceeded our expectations. From the small details to the big last minute changes, Sarah and DWI always made themselves available to accommodated our requests with upmost professionalism. All vendors that were suggested to us by Sara were of quality and very professional. We communicated at least once per week via email or Skype. In the weeks closer to the wedding, Sarah made sure to speak with us daily or as needed for last minute decisions. 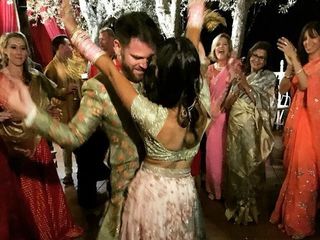 Again, HUGE thank you to Sarah and her team at DIW for putting together the most elegant, fun, and intimate wedding weekend together at such a marvelous venue in the most beautiful place in the world! We had the most amazing weekend, our wedding was simply magical!! It's hard to explain the nerves and the constant wonder of how the day will come together when you hand the most important day of our lives to someone else. All we can say is that we had no reason to stress you were fantastic and we could not have been in better hands. Everything turned out better than we could of have hoped for and it was like being in a fairytale. Throughout the weekend we were asked how we found this hidden gem and heard people saying it was like something from a magazine. They were blown away by the beauty of the venue. The food was delicious, the cake was incredible and the saxophonist was truly wonderful!! The flowers and centrepieces were stunning and more beautiful than imagined. We often told you how much the music meant to us and worried about the dj, there was no need as the party was great and our friends and family danced all night. The next day we all sat together laughing about each other's dance moves. My father said that he didn't want the night to end - which is a rare thing!! 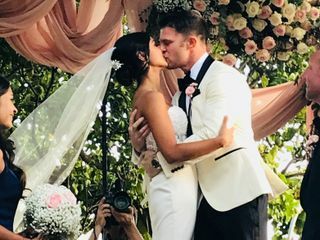 I do not think there are words to express how truly grateful we are for having you as our wedding planner, choosing distinctive italy weddings was the first step towards our incredible day!! A massive thank you to your team and all who helped on the day including your assistant, who was also complimented by many. We would also like to say thank you to you Rosanna as you were the first person we spoke with and made us feel important from the start. The whole experience was incredible. Every member of the DIW team that we met was friendly, attentive and professional thank you for making our wedding day everything we dreamed of and more. We shall not hesitate to recommend you all. From the bottom of our hearts one last massive thank you Raffaela, both our families send their utmost gratitude. Italy has always been my dream wedding destination since I was a little girl. 10 years ago I visited Capri and fell in love (right before I met my now husband). The second Walter proposed I knew exactly what I wanted and you ladies made it happen. Words can't even thank you for all your hard work and dedication. Rosanna- thank you for the initial responses and inquires regarding our proposals as well as following along our journey the entire year! You helped Walter and I choose right away the exact location and made us feel comfortable from the start. Stefania- the minute we started planning , I knew you had it all together. I was nervous at first because normally I'm always in control of everything. You quickly settled my nerves and took over, smooth sailing! Honestly, everyone says how stressful it is to plan your wedding and all, but you couldn't have made it any easier than you already did. Thank you for the constant back and forth, checking with vendors and especially the day of! You made sure everything was perfect! You got my vision (aka Pinterest board) and made it even better than I could have imagined. Everything that day was just perfect - the weather, the food, venue, transportation, DJ, photographer, videographer, flowers and last but not least, your precision of timing for everything! We were so on schedule from everything you told me that was going to happen, happened that time! From the bottom of our hearts, thank you for truly making our dreams come true. Our guests were in complete shock of how beautiful everything was. They keep saying how it was the best wedding they have ever been too! Our wedding was way better than we could have ever dreamed and none of it would have been possible without DIW expert advice and endless efforts (and patience). L'Andana was denifitely the best place in the entire world we could possible have our wedding. It was even prettier than the pictures DIW showed. We wanted something really specifc, and we are so thankful Sarah and Rosanna understood the spirit of where we would like to celebrate our weekend and were able to convert it into the perfect venue. Their wedding planning services are spotless and remarkable throughout the months- they were tireless and definitely the perfect planners for us. Always so kind and understanding with our crazy schedule and senseles requests, going out of your way so many times to make us happy. We appreciate so much all they've done for us! Oh and they have my mother's total approval as a wedding planner and mother of the bride. She loved everything and said she wouldn't have done a better job herself! We had the most fantastic wedding day! Everything that was arranged was absolutely perfect! Distinctive Italy made the whole process so easy and their was never any stressful moments for us. You did absolutely everything that we asked for and made us so happy. We have given you 5 stars for everything as you provided a fabulous service. I found the hairdresser and make up artist really lovely people and they made me and my bridesmaids feel really relaxed. They listened to what we wanted and we all felt so special with our hair and make up done. Our hair and make up looked lovely throughout the whole wedding and we all felt amazing. We found Villa Eva a truly special venue, it looked so pretty with all the flowers and the way the tables were set up so nicely. The staff were superb and really made our guests feel special. They were all very attentive. Anna was excellent throughout the entire day and was so helpful. Our parents, family and friends were totally blown away by the venue and the way that Anna led the day and evening. All of the food was really delicious and every person enjoyed every single course and said they had never eaten so much lovely food. The wedding cake was everyone's favourite cake. It looked and tasted amazing! 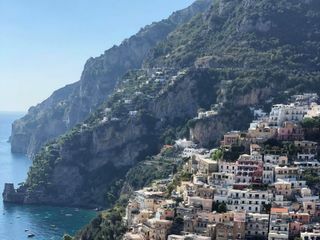 Ravello was the perfect location for our family and friends. As its very small you couldn't go far without seeing some of the wedding party and it made everyone really mingle well a few days before the wedding. Everyone found the views absolutely breathtaking. All the hotels are great and there are some delicious restaurants. We had quite a lot of children attending the wedding and their parents felt that Ravello was so safe and really great for their children to run around. We really enjoyed working with DIW and our wedding planner, Raffaela Cian, was a great fit for us; being very organised and experienced. She was not daunted by the type of event we wanted to hold (a large wedding with a big focus on fun!) and the quality of the vendors we were introduced to was, in every instance, 5*. Whilst response times were probably a little slower than we would have ideally liked in the beginning (which I do understand was due to the wedding being some months away and also, things just work very differently in Italy to the UK! ), Raffaela was very available to us in the weeks and days leading up to the wedding and answered all of my small (but important to me! ), queries without hesitation and with a lot of patience - thank you Raffaela! Raffaela was particularly good at being realistic with us - if something was a possibility she would let us know and if not, she would tell us straight away so we didn't waste time and energy thinking about it - I valued this highly! Similarly, I really appreciated being able to speak to the owner of DIW, Rosanna, directly when Raffaela was away, regarding vendor options to get her genuine opinion, straight talking is very important to me! The team on the day were also excellent - Antonella and Raffaela in particular did a fantastic job making sure everything was running smoothly and I really felt that they both genuinely cared about the success of our event. My husband thanked Raffaela in his speech and that was truly meant. We also loved celebrating with the DIW team at the post-dinner party, it was great to see the result of all our hard work. DIW were amazing. Easy to talk to. Organised through every step of our wedding journey which resulted in a perfect day and the best day of our lives! Can't thank you guys enough. You guys took all of the stress out of the wedding for us and held our hands through every step. We knew the day would be amazing but we didn't realise it would be mind blowing!!!! Thank you so much for everything, we would highly recommend you to anybody looking to use your services. A huge thank you for all your hard work as our wedding planner. You were excellent throughout! Our wedding day was so special and beautiful - we enjoyed every minute of it, as did all the guests. The Pre-Wedding Party at Cantina Follie went really well – everyone really enjoyed the food and the wines. Joost and his team were excellent. Villa Cipressi - Excellent – from the staff to the food to the back-drop – we cannot fault this venue. David the manager was very friendly and easy to work with, also very calm and collected. The food – everyone loved the food, it was delicious – an excellent and plentiful aperitivo buffet, and the multi-course dinner was fantastic. Wine – this was also very high quality, and everyone enjoyed it a lot. 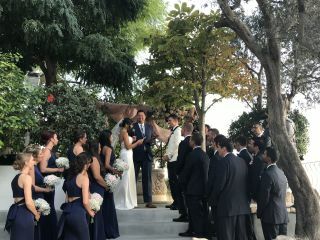 We loved the ceremony location, in a very nice shaded area right by the lake. On-Site Co-ordinator: Angela was super – very calm and collected, as well as being friendly. Everything ran very smoothly. Angela did a great job at translating during the ceremony and injected a sense of light-heartedness to the proceedings which we really appreciated. Hair: Pamela was great, very patient and excellent at up-dos. She was very calm, professional and friendly – I was very pleased with my hair. Makeup: Again, Veronica was great. I loved my wedding makeup, it was exactly what I had asked for, classic and natural yet still polished. Flowers: Beautiful flowers. I loved my bouquet, which also had a wonderful scent from the freesias. It was a bit of a shame that none of the agapanthus had opened before the wedding, but it didn’t detract from the overall look. Musicians: Wow - excellent. They really enhanced the overall feel and emotion of the wedding. Photographer: Dani and Stefano were both first-class – very good at knowing where the best spots to take photos were, also very calm and friendly. Boat Ride: This was great fun, everyone really enjoyed the boat ride. Favours: Looked great and were delicious. Gavin and I live in South America and we chose to get married in Florence, Italy as we love the place. DIW made it really easy for us to plan the wedding day even with being so far away. Our wedding planner Sarah Bongini in particular was excellent. She was very professional, always quick to respond and provided detailed information on any questions and or services requested. We had an amazing time and all of our 90 guests from all over the world really enjoyed the wedding event as well. It was a huge success.